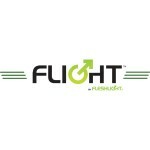 Flight by Fleshlight was created as a simple, sleek, discreet device to be used by men who are “on the go”. Flight, which is smaller than standard Fleshlight products, is easy to travel with and it contains no anatomical features so it’s very discreet. The Flight case is aesthetically pleasing so it can be left out without individuals identifying what it is.